I've never seen one in the wild before - other than a squashed one on a road once. It was early evening and I had just dropped onto the road alongside Loch Ness. I was hoping to spot Nessie, but instead I saw a red squirrel. Except it took me a while to realise I had seen one. Sleep deprivation can do funny things to your mind and make some thought processes rather cumbersome. As I rode along, there was a gateway with walls either side and on the end of one of the walls was this amazingly realistic statue of a red squirrel. "wow, that's a really good statue" I thought to myself. Then it moved slightly. "wow, that statue moves" was my next thought. It took me a while to work out that it wasn't a statue, but a real red squirrel! I put the brakes on almost alongside the squirrel - who looked at me and bounced off along the wall. It was a fleeting glimpse, it took me a while to work it out, but there it was, a live red squirrel! Lovely. 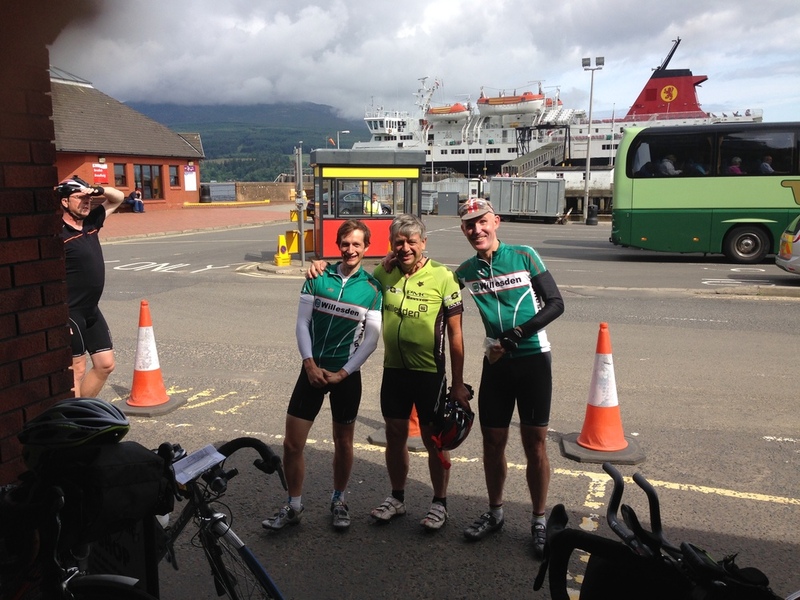 Most people's first night stop was Oban, after about 210km. This was one of the weirder long rides timing-wise. 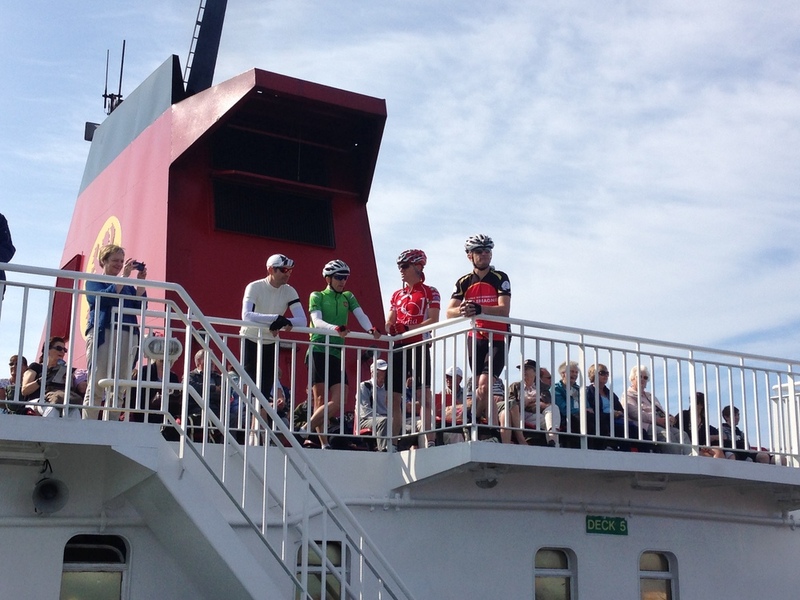 We'd started at a time that gave us no real chance of making the last ferry from Oban to Craignure at 18:00 (whilst it is perfectly possible for a strong rider to do a 7 hour hilly 210km, there was another ferry to negotiate as well en-route). 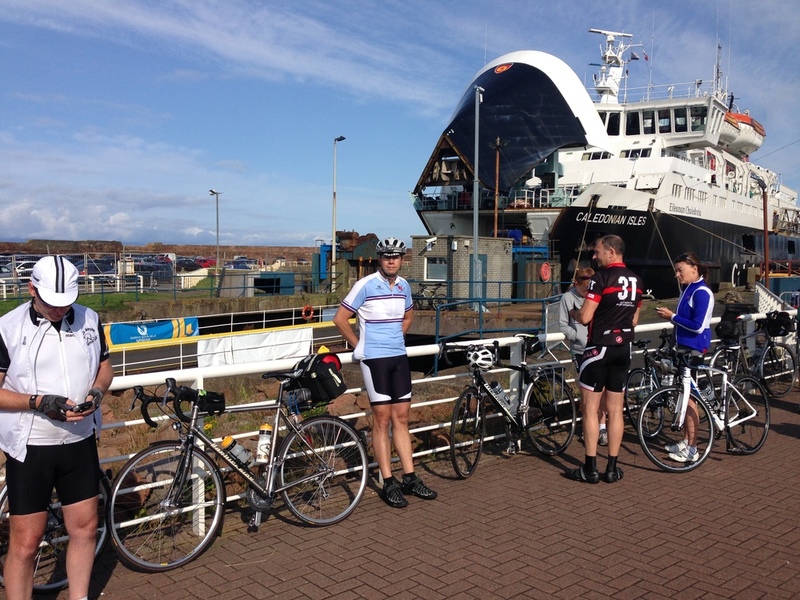 So, almost everyone would reach Oban between 9 and 11pm ish and stop for the night waiting for the first ferry at 7:45. Most first days on long events are long - you are typically aiming to get deep into the ride before sleeping. PBP, for most riders, starts from around 4pm to 9pm and will involve riding through the first night, into the day and as far into the second night as you can manage - most people will ride 4-500km before stopping to sleep. All you are ever doing on long rides is building up your time buffer to give you time to sleep. You are trying to get 4-6 hours ahead of schedule each and every day. And here we were with an enforced 10 hour stop! Anyway, my club-mate Martin and I rode the last section of the day together (always a bit of a stretch for me, as Martin is very rapid indeed!). 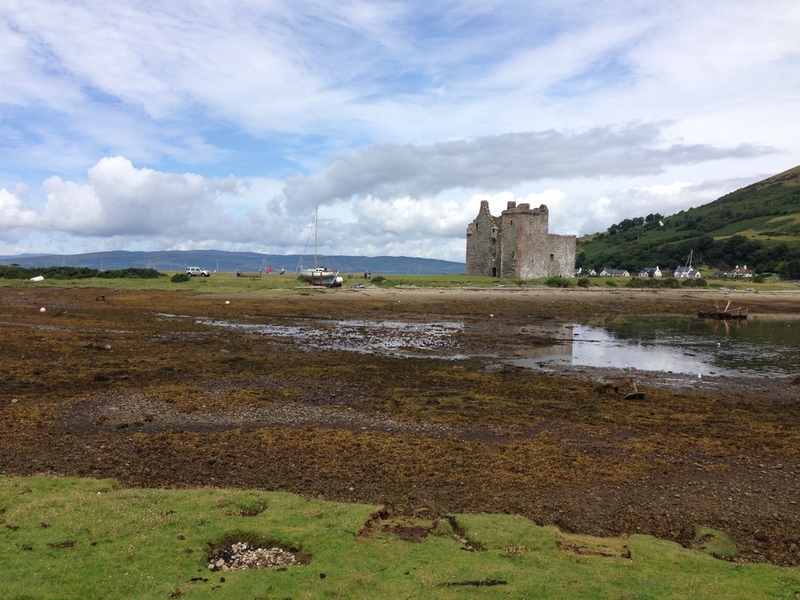 We'd arrived into Oban and found our hostel - well after a failed attempt when we went into the Backpackers Plus Hostel (carrying our bikes up two flights of stairs) only to be told our booking was for the Backpackers Hostel over the road. I had a real craving for something spicey, so I was pretty pleased to spot an Indian takeaway 2 minutes back down the road. So we went and ordered curry, this also enabled Martin to have a cheeky beer whilst we waited (the Scottish off-license laws are designed to make it hard for long-distance cyclists to get a beer or two after a long day!). It felt great, sat around the table in the hostel with Martin and a couple of Dutch riders, still feeling pretty good and fresh having enjoyed a superb day of cycling. The curry was pretty good and hit the spot perfectly. Day one sort of felt like a prologue, and we knew that this was going to be the last time we'd be able to relax and not think about time. I ate all sorts of food on the ride, but just sitting there eating curry is the meal I remember the most! 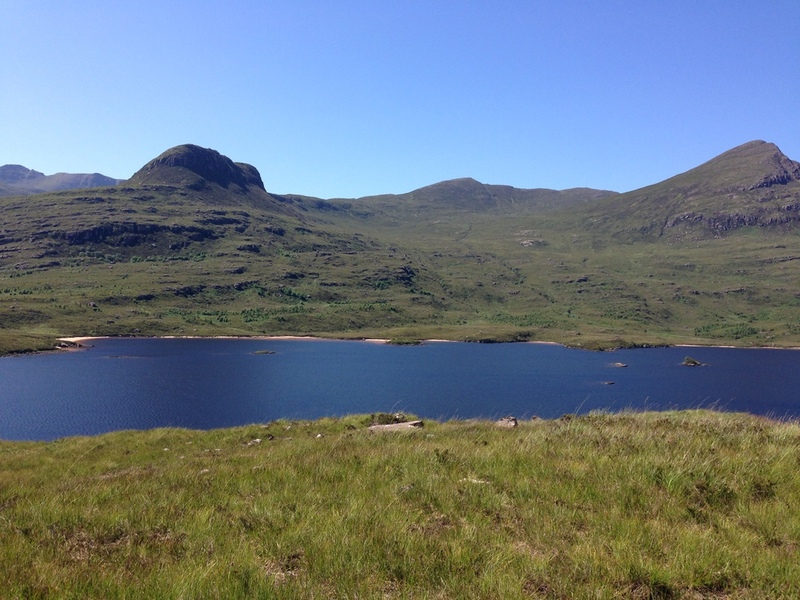 On the Thursday night, I had slept at Glencoe at just over 1100km completed. It meant I had a reasonably relaxed final day with around 190km to do, and I had around 15 hours to complete it. I calculated a decent sleep into the equations and didn't get on the road until 8am. I had an issue with food - I was out of food really, so hoped there was something en-route. I had one cereal bar, which I ate at the hostel, which helped a little. I hadn't really eaten since around 8pm the night before at a pub. 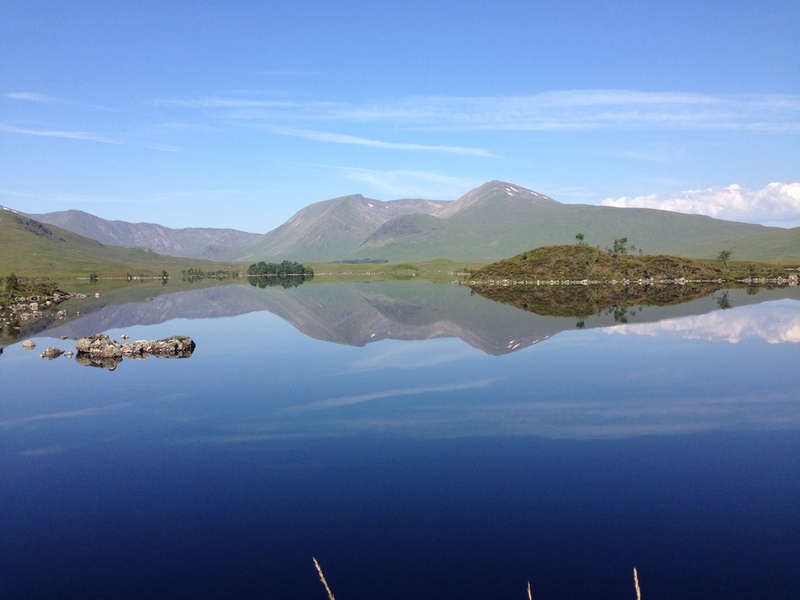 The day started with the massive climb up onto Rannoch Moor. Whilst the climb was very pretty, the road is also the only real route for everything, so it was pretty busy with cars and trucks which was a bit of a wake up after hundreds of km of deserted roads. As the road ramped up, the head winds also increased. I was in a bit of bother. I dug into my front bag to pull out an emergency energy gel. 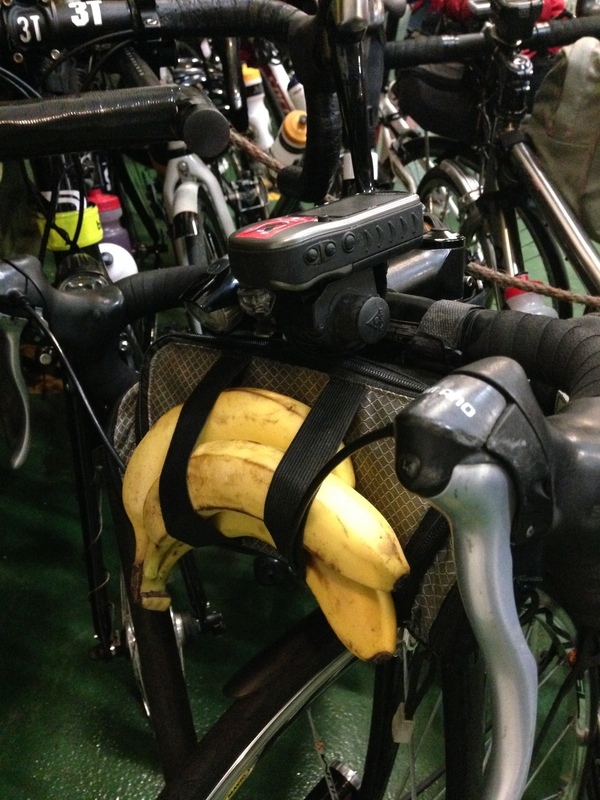 Not something I use very often on Audax rides - but I needed energy fast. The climb was superb with dramatic views. Seeing pockets of snow up on the mountains was great considering we'd spent 4 days in temperatures of 29-30 degrees. I felt like jumping off my bike and running up the mountains just to experience lying in that snow! The top of the moor really was special and it was nice to stop and take some photos. A couple of riders had slept on the moor the previous night - that must have been really magical. In 1300km of riding, we saw a massive variety of scenery and experienced some magnificent climbing of every kind. One of the finest sections was early on in the ride - it also put the fear into us all as it was rather tough. We'd got off the ferry in Claonaig and were heading along the eastern coast of the Mull of Kintyre - it was exceptionally beautiful and rather challenging terrain with constant choppy climbing that is typical along coastlines. 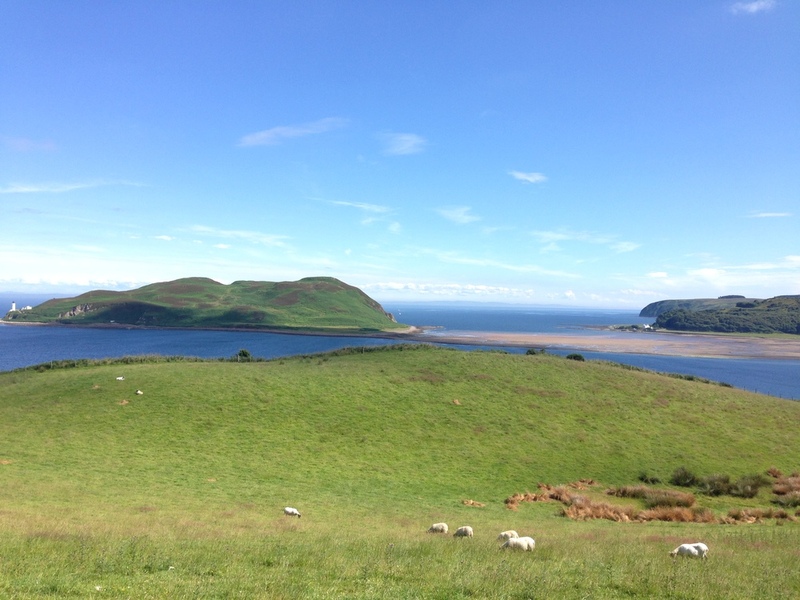 We were treated to fabulous views back onto Arran as we rode along some beautiful little single track. I think it was also the beginning of the realisation we were in for a hot few days - the temperatures were beginning to rise. A fabulous bit of road and really got us set up for the rest of the ride. We arrived into Campbelltown and I think we all felt the same - "I hope the next 1200km isn't all the same as that, or I'm not going to make it!". Choppy, steep climbing can really take it's toll on you - often it is hard to regain speed on the descents as they are twisty and challenging and don't allow you to carry pace up the next hill. I would love to go back and do more riding in the area - at a more gentle pace! On the fourth day, I rode pretty much solo all day - the field was well spread out. The section after the hostel was just magical. It was hot and remote and just spectacular. I'd seen many birds of prey over the ride so far - mainly eagles. As I rode along, way up on my right was a ridge with something big flying along. I couldn't quite work out what it was. A few minutes later, I heard a whooshing sound, as the most enormous bird of prey flew very low over my head - shocked me a little. It was grey with a white head and just enormous. I am not great at identifying birds, but I did immediately think it was an osprey - subsequent googling seems to suggest I was right. The bird was awesome to see up close and personal and was yet another thing I hadn't ever seen in the wild before. On the second day, I rode much of the latter section with Matt and a group of three Leicester riders. A fabulous section (see below), and our first ride deeper into the night (with there being little need for front lights before around 10:30 pm). It was also our first real encounter with the midges! We'd climbed up near Loch Maree and we were being treated to some beautiful skies through the gloaming time. As it got dark, we could see the remains of a blood red sunset in the distance at the bottom of the valley. It did feel very primeval with some mysterious volcano or something hiding behind the hills. Matt said it felt Tolkien-esque and I think that nailed it really. It was one of those things that no photo would do it justice, but I will remember it forevermore. A truly magnificent bit of road and time. Without doubt, this was the best section of scenery we were treated to. 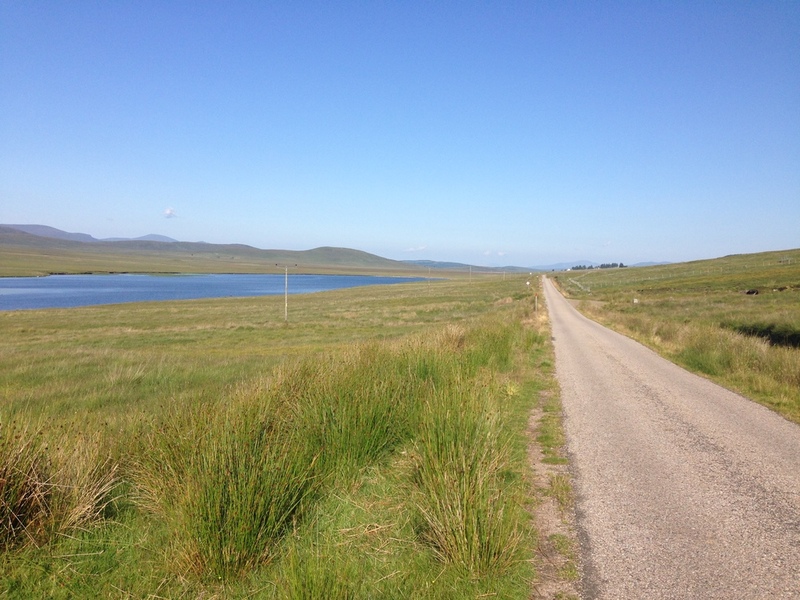 We turned away from the main road (well, most people did - some did the main road in and out) and rode along side some beautiful lochs with views of some great mountains. The scenery just got better and better and then we took a turn back onto ourselves to start really climbing - that was amazing as suddenly we were looking back onto the roads we'd come along and the back side of the mountains we'd been looking at. And then we were treated to a really challenging section of cycling. Very narrow, steep, twisting single track road for miles and miles. Very, very beautiful and very tough. Some of the best riding on earth I reckon. This is really about the banter and comradeship. I made many new friends, and strengthened old friendships. I love riding solo, but equally, it is great when you're riding along at a relaxed pace in a group, chatting and joking. As I said, the end of day two was spent in the company of Matt and 3 Leicester riders. We were just all enjoying the scenery and chatting about this, that and the other - stupid stuff at times, serious stuff at others. Having been on Skye, where Danny MacAskill is from, I had suggested to the Leicester riders that Matt had taught him everything he knew (totally untrue of course, but it provided some amusement for a while). Just riding along, suggesting that Matt really couldn't show them his tricks as he was hindered by his panniers etc., but had he not been. We talked about all sorts of other stupid things through the 5 days - but that little episode sticks with me as a real highlight. Riding a long way is hard, and other people can make it easier and help tick off the miles more easily. Sometimes you only get to chat with other riders at controls, but often riding alongside them for only a few minutes can be some of the best times possible on bikes. 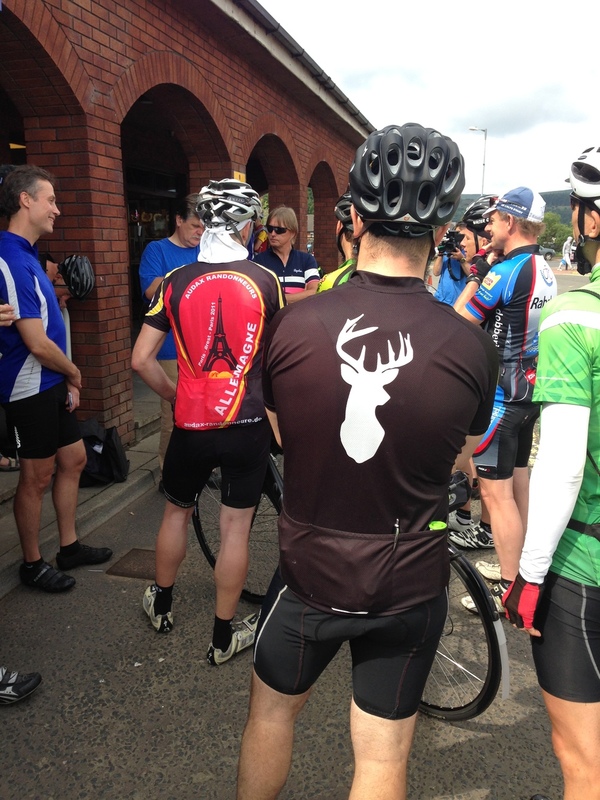 Audax is a friendly scene, and we do all look after each other however we can. Even just a few quick moments chatting as you pass, or are passed by, someone can raise your spirits greatly. On the final day, we rode through some more scrubland type environments. As I rode along, I kept on hearing cracks and soon worked out it was the gorse and it's seed pods. At times, it was coming from all angles as we were surrounded by gorse. It was one of those magical bits of timing - a day or two either side and I might not have experience the cacophony of noise as the seeds were being fired everywhere (up to 30 foot according to a quick bit of research). Sounds can stay with your memories really quite well - I will remember the sound of popping for a long time. We had to sort out our own accommodation for the whole ride, this was the one place that Mark, the organiser, had booked - primarily because there was nothing else for a long way. This was in the most remote part of the entire ride and was more than welcome. It was going to be a late night into the hostel - I was pleased to have reached the pub at Durness in good time to get some proper food (though it took a long time as it was rammed). The night section had proved difficult - I was getting tired and slow. I had to stop for a short nap at one point. I think the heat added to my general fatigue. I saw my arrival time at Trantlebeg drift back and back. I was actually pleased to find the hostel was around 6km closer than marked on the routesheet. Arriving into this beautiful little hostel http://www.achumore.co.uk/ was fantastic. Great to see Mark and enjoy a bit of food and a decent sleep at this little oasis in the middle of nowhere. The midges were pretty bad there though - I felt for the film crew (the event was filmed for a BBC Scotland documentary) filming us leaving. I managed to get some good sleep at the hostel, could have done with more though! I really felt for those still coming in when I was heading out - they had had long nights on the road. As I wrote in my previous post, this was always going to be a tough ride - it was hilly, the terrain was remote and food/drink would be an issue. I thought I was as well-prepared as I could be - but nothing prepared me for 5 days in very high temperatures. We were treated to some of the best weather northern Scotland will have experienced in a while - very high 20s every day with some humidity as well. There were some fabulous tan lines on display by the end, and a few red patches - I managed to burn the back of a calf which caused some discomfort. Food and drink were an issue at a couple of points, but I just about got away with it. My timings just about allowed me to make some evening meals before things closed and having researched where I needed to stock up on supplies, I was just about okay. The ride was just fabulous, a route that allowed us to see huge variation in terrain. The roads were, on the whole, very quiet - there were some busy main roads that were a bit of a shock to the system after the remote roads. I just about managed to get enough sleep - as I wasn't racing around, I had always planned to stop for as much as possible at my accommodation. My pace was slowed by the heat, so I did eat into that sleep somewhat. It was a very tough ride with the heat - certainly took it's toll on my body. My feet hurt a lot - I think they swelled up and put a lot of pressure on my shoes. Top of right food certainly hurt. Knees took a beating as well. Through dehydration and general calorie deficit, I dropped around 3 Kg over the ride (and those that know me will know 3 Kg is actually around 5% of my typical body weight!). The route would make a fabulous 10-14 day tour, but I never felt that we were being disrespectful to the area by going through it in 4.5 days. Sure, I would have liked to have stopped more, enjoyed local attractions etc. - but we got to see so much amazing scenery in such a short space of time. I am not sure if Mark will run the event again, certainly not for a few years. There were a lot of DNS (from around 75 entries, only 35 of us started) which is always disappointing. It is available as a permanent event - and can be ridden at the same pace as we did, or as a Populaire at 100km a day. Both would be a rewarding experience. It was definitely the hardest 1000+ I have yet ridden - hills, heat and lack of facilities made it very challenging indeed. Glad to have finished it - it is an experience that I will remember fondly for a long time to come.